The Force Ten Classic was the early and enduring star of Vango Tents and rapidly became a market leading product. The brand name was developed from the tents’ ability to provide strength and stability in adverse weather conditions. These two attributes were attained through the Classic’s innovative streamlined shape, which produced bell-shaped ends, both front and back. This was an iconic design that was said to have revolutionised the camping industry and it is as recognisable today as it was in the 1960s. Easy to erect, yet tough and durable, they perform exceptionally well in all kinds of weather and provide welcome respite from even the most savage conditions. Using a Protex® DWR Cotton flysheet and inner it offers a lighter, smaller pack and a cooler space inside the tent as well as good protection from the elements. The popularity of Force Ten increased greatly - and swiftly - after their introduction in 1967 and was the favourite choice among Duke of Edinburgh participants, The Scout Association and The British Army. It was also selected as the brand to assist Doug Scott – the English mountaineer – complete all 22 of his expeditions and most famously was part of his 1975 expedition, led by Chris Bonington, that resulted in the first successful British ascent of Everest. 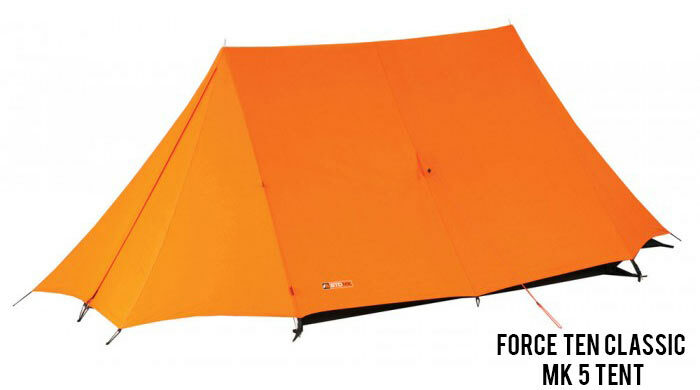 Force Ten continue to make innovative tents that perform in extreme conditions and are built to last. The Force Ten Classic tents and spare parts for the tents are available from Blacks of Greenock Tents for scouts, groups and those looking for a classic style.